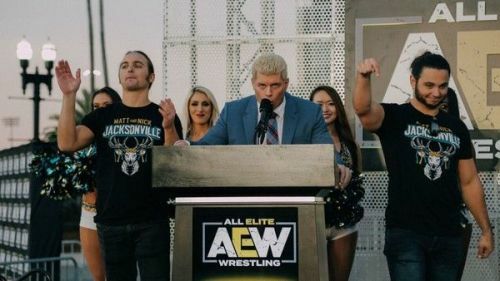 Will Cody Rhodes announce a television deal at AEW's February 7th rally? The Wrestling Observer (via WhatCulture) are reporting that Cody Rhodes's fledgling promotion All Elite Wrestling have two huge television offers on the table, with two big-name TV stations, one of whom may be TNN. Television is the biggest money maker right now in the wrestling business in the post-WWE Network era. If AEW can win a massive television deal than that would secure the company's future for the medium term and enable Cody and company to procure the contracts of big WWE names whose contracts are nearly up such as Dean Ambrose and enable them to afford other top names such as current Elite member, Kenny Omega. It is still unknown who the two stations are but it is said to be "the best TV deal any non-WWE show has had since WCW." Simply put, such a big TV deal would make AEW major players in wrestling and the de-facto number two wrestling promotion in the United States. It would make AEW legitimate competition for WWE and could spell trouble for Impact Wrestling who are currently airing on the not widely available Pursuit Channel. Apparently, according to the Observer, AEW's meetings with TV executives have gone "real well" and this is an exciting time for AEW and wrestling fans worldwide. At this stage, little is known about the potential stations that could air AEW programming and whether they will produce weekly episodic television or not. AEW will be hosting their second event rally on February 7, 2019, in Las Vegas, Nevada, where their first live event, Double or Nothing is scheduled to be held in May. We could well see any potential TV deal confirmed there. Do you think AEW will sign a massive television deal? Let us know in the comments!